First Birds, then Squirrels, oh My! I posted the video of the Bird that was driving me crazy, after getting shot at by a few tennis balls every time he came to visit, I think the Bird has decided to bother someone else. 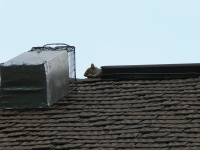 But, not that the Bird is gone, we now have a new problem, apparently some squirrels have decided to make a home in our attic. 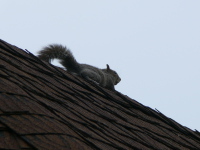 Our pest control company recommended a local company, who came out, eyeballed the nest and decided it was going to cost us $4,000 to remove the squirrels and fix up our roof-line to insure that it wouldn't happen again. 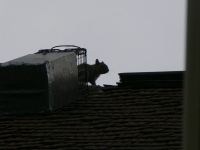 Well, I wasn't so thrilled about the thought of paying $4k to remove some squirrels, so I went on to Angie's List, a service where you can find just about any service person and see unbiased ratings from others who have used the service. 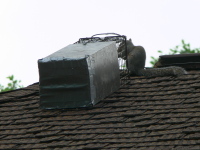 On Angie's List I found a company that was well recommended who is removing the Squirrels for $375. To be fair, they did recommend some other fixes to the roof, some needed now, and others as more future prevention. The other company only gave me one option, $4k. 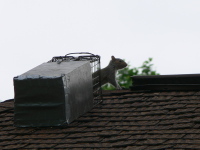 So now there are squirrel traps on my roof and in my attic. They leave them open (un set) for a few days to let the squirrels get comfortable getting food from them for a few days, and then set them to catch them. I was able to get some pictures today, enjoy! (click on one to see it close-up). It's not often that I recommend companies, but I wanted to let you know about onCall 25/8. Addison's laptop was going on the fritz, he was having problems getting the computer to start charging when he plugged it in. You should have seen the incredible ways he would have to move, push and pull on the charget to get the computer to start charging. Finally it just wouldn't charge no matter what he did. The laptop was out of warrenty, and Gateway said that they would have to replace the whole motherboard, basically saying the cost of fixing the computer wasn't worth it. BestBuy's Geek Squad wanted to charge me $80+ dollars just to send it out to be diagnosed and then they would let me know how much it would cost to fix, yuck! I went online and and found a local company called onCall 25/8. They sent someone out the next day and created a case number for my laptop. They quickly diagnosed the problem and were able to replace the laptop's powerjack at a reasonable cost. Addison is back online thanks to OnCall 25/8. Thanks guys! If I have any computer repair issues that I can't resolve on my own in the future, you can bet that you will be the first ones I call! Here are some links guys to help your site, you deserve them!! !